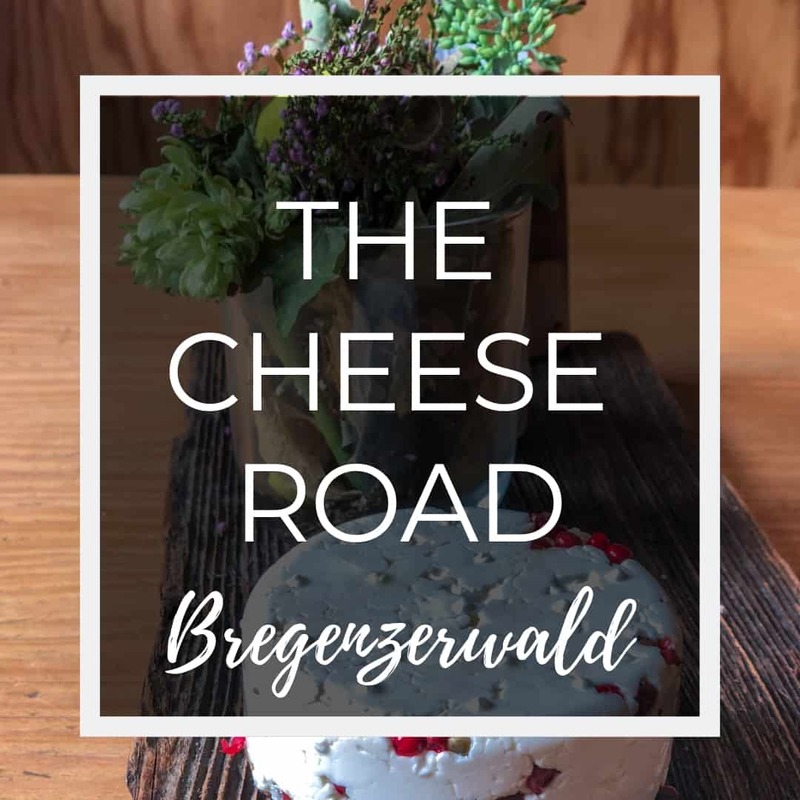 One of the most enticing "off the beaten track" routes in Austria is the Käsestrasse, or cheese road that runs through Bregenzerwald. Culture, innovation, tradition and cheese at the ready. Here's what it is and how to travel along it. ​Käsestrasse. The literal translation means cheese street. Alternatives include cheese trail, cheese road and cheese route. All of which do Bregenzerwald’s 100km käsestrasse a great disservice. Cheese tasting and education, perhaps? Cheese extravaganza even better. But travel with me through these steep and deep green mountains in Austria and tell me what you think the name should be by the end. We’ll walk on 4000 year old ferns, step through open-air bus stops designed by some of the greatest architects in the world and hear about some medieval herbal healing practices directly approved of by the Pope. And, yes. We’ll both eat and make some cheese. Cheese with UNESCO cultural heritage status, no less. Chutneys, crackers and grapes at the ready? Let’s go! 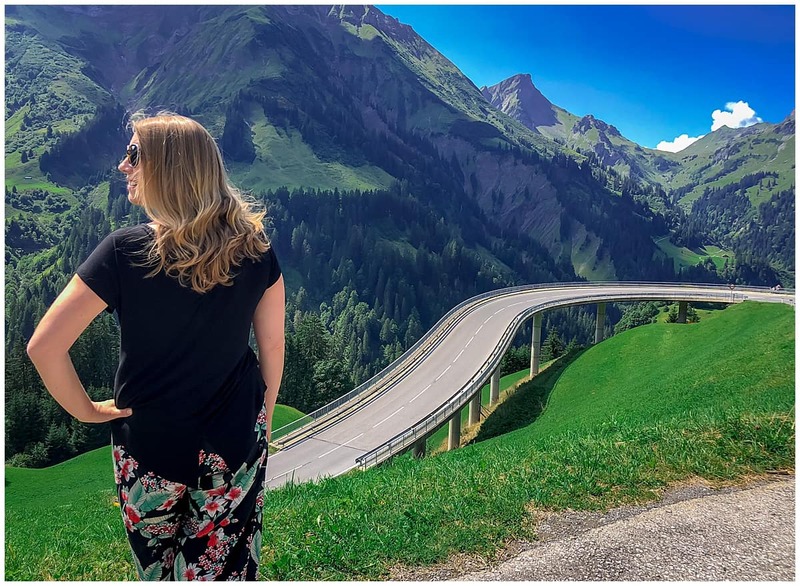 It’s right on the western edge of Austria, in the state of Vorarlberg, snuggling up to Germany, Switzerland and the tiny principality of Liechtenstein. ​Every self-respecting mountain has a love affair with cheese. Born out of necessity for surviving cold winters, cheese production takes place throughout the Alps. So, what makes the käsestrasse different? It’s gathered together nearly 200 local operatives into one cheese route in the splendorous beautiful mountains of Bregenzerwald. From history to tasting to learning how to make cheese yourself, the käsestrasse leaves no cheese unturned. It’s a remarkably creative project that’s just turned 20 years old and which reflects the spirit of innovation found throughout a region that remains steeped in tradition as well. “Preserve the old, appreciate the new,” is the motto and, to be fair to the place, it’s rather good. From a traveller’s point of view, the käsestrasse provides a lovely way to bind together this hidden region’s collection of things to do. Like so much of Austria, the beautiful mountain scenery and painfully cool application of the arts combines with traditional Juppe, heart-shaped motifs and lacy, cosy window dressing. Plus, hiking. A lot of beautiful hiking. But don’t be afraid. You can hike or drive this beautiful region, staying in luxurious accommodation and feasting on ridiculously sumptuous food. Here are the highlights of the käsestrasse. 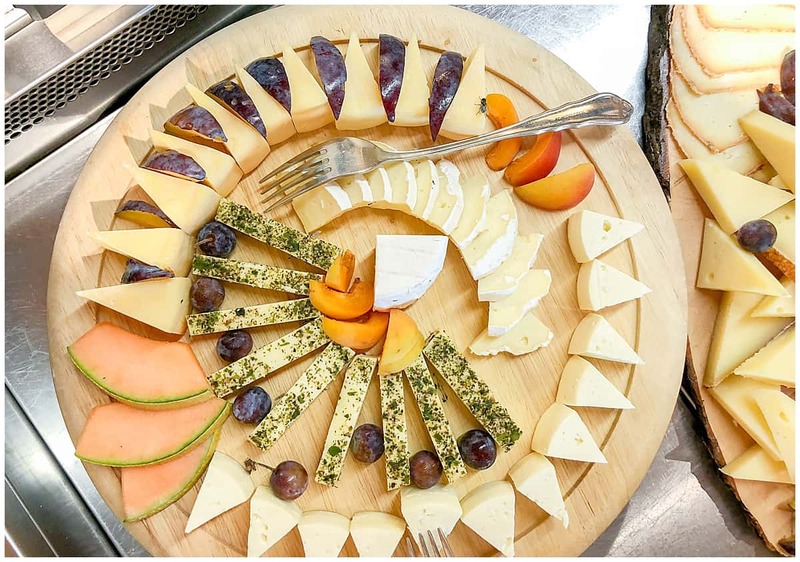 ​Set aside a full half day (and perhaps a designated driver) for the cheese-making session at the Metzler Farm in Egg. 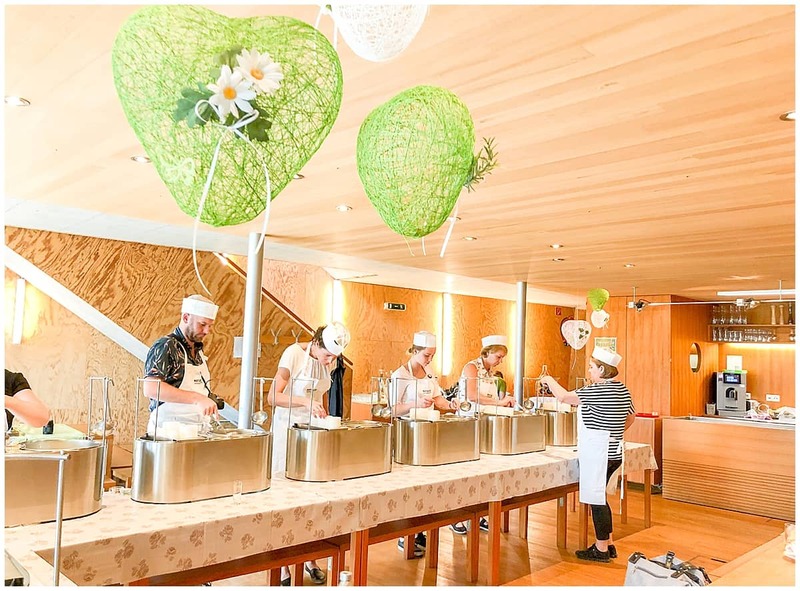 Every participant has their own stainless-steel cheese station and over only a few hours, the indomitable Frau Kaufmann sees you turn milk fresh from the bucket into a soft, creamy satisfying disc of cheese. Check out the cosmetics made from milk along the cheese route. Two words of caution, though. One, locally produced schnapps is presented at every turn. 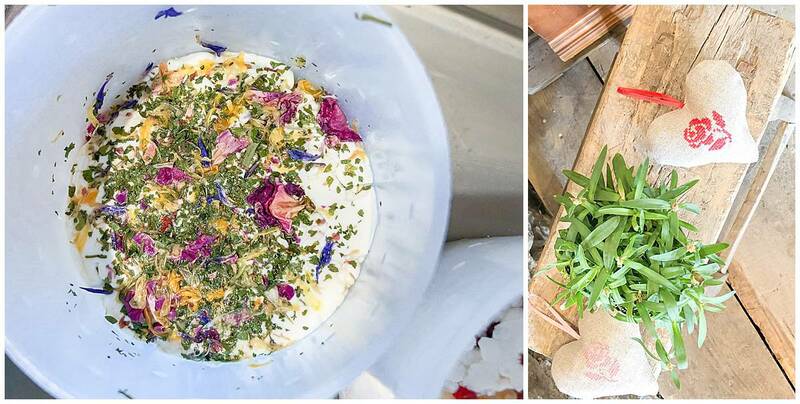 Two: you can add your own “flavour” to the cheese through a selection of locally grown herbs. I went for the pretty ones in cornflower blue and bright peppercorn read. With (rather too much) garlic. In both of these situations, I think it would be fair to say that less really is more. 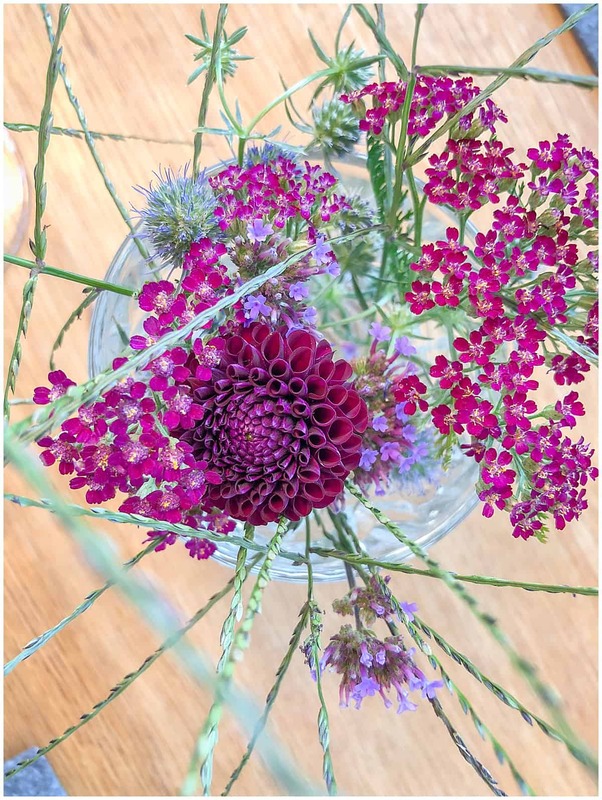 Connected to the Romantik Hotel Das Schiff with sun-splashed gardens decked and flecked with flowers and herbs, this is a modern take on dining out in Austria. Cheese tasting tours in the cellar are available on request and the shop serves local favourites like pickled beetroot, mustard, jams and schnapps. Glimpse inside a 300 year old dairy kitchen and learn the facts and figures behind cheese-making in Bregenzerwald. In the tiny village of Krumbach, travellers arrive from across the world in order to marvel at the bus stops. Yes, indeed. These seven bus stops show what can happen if you really put a bit of creativity into everyday life. 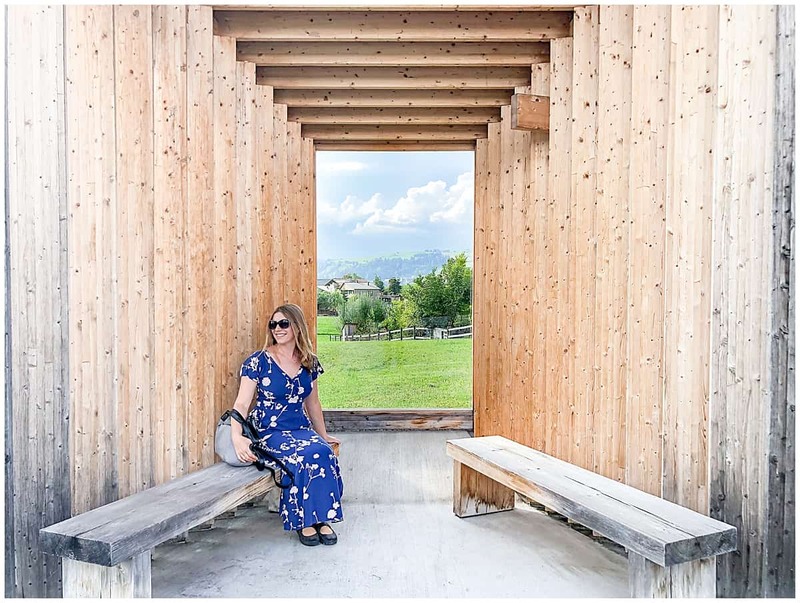 Krumbach opened up their design to architects around the world: the prize was a trip to Bregenzerwald. The winners were Alexander Brodsky from Russia, Rintala Eggertsson Architects from Norway, Architecten de Vylder Vinck Taillieu from Belgium, Ensamble Studio Antón García-Abril from Spain, Smiljan Radic from Chile, Sou Fujimoto from Japan and Wang Shu from China. It’s another beautifully-designed hotel decked out in silver fir, local oak, and stone pine. But this one has a twist: its wild woman menu and homage to the Healer of the Rhine, Hildegard von Bingen. Considered by some to be Germany’s first female physician and the mother of German Botany, von Bingen survived a sickly childhood to receive recognition from the Pope in the Middle Ages for her work with herbs and healing. 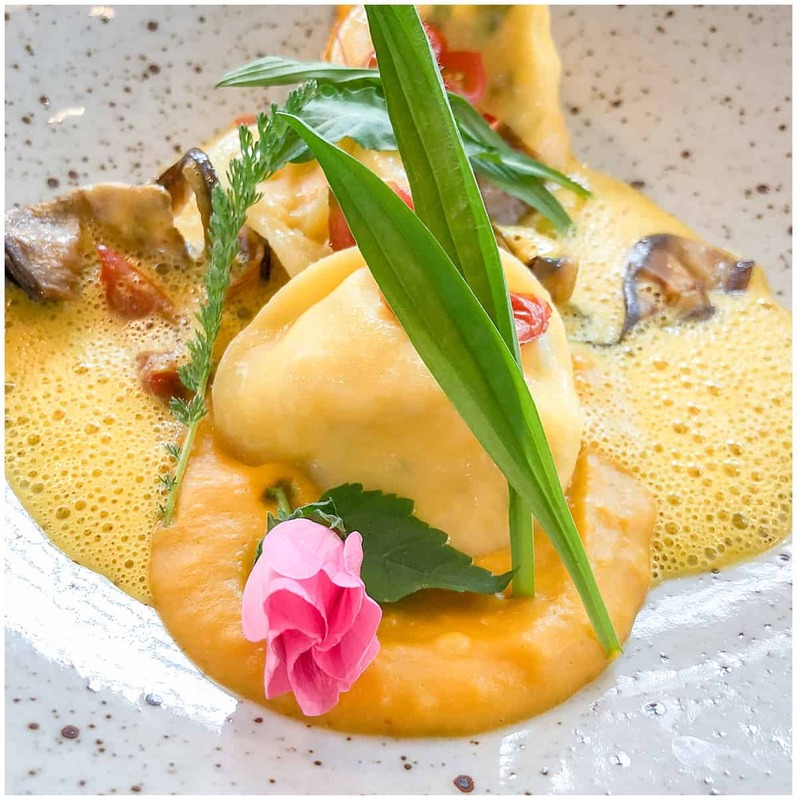 The chefs at the Hotel Schwanen take inspiration from her work in their food. Though if you’re not sure about all that, you’ll also find traditional Austrian delicacies too. Despite the sound of it, this is indeed a relaxing, even luxurious thing to do. The Krumbach Moor has peat aplenty, with 4000 year old ferns and a spring in its step like I've never felt before. I'd highly recommend finding a guide as its highlights are otherwise easy to miss. And I'd also recommend you kick off your shoes, leave the designer shelter behind, and walk on the mud. So, the typical way to do things is to get up at dawn to walk along the Moor. Then reward yourself with a hale and hearty breakfast. This is a meal to celebrate with friends. Yoghurts topped with candied nuts. Homemade honey and jam. A choice of eggs. And, of course, plenty upon plenty of cheese. Book Brunch at Adler here. Yes, that’s right. As part of the Intangible Cultural Heritage programme, Austria now has its “three layer cultivation” method inscribed on the UNESCO List. For centuries, people have practised three layer cultivation in Bregenzerwald. Cattle graze on valley pastures, then on mountain pastures, then up into the high mountains in mid-summer before coming back down to the barns for winter. It’s an agricultural practice that not only makes the most of the fields but also gives cows an herb-rich diet, resulting in aromatic milk and, therefore, the distinctive taste of the cheese. But it’s hard work. A typical farmer has around 30 cows instead of the several hundred found in factory farms. Together, tourism, farming, commerce and nature combine and that’s the point of the Cheese Road. And a lovely example of sustainable tourism. The Kaesekeller is a loving home to over 32,000 blocks and loaves of cheeses. In fact, it's Europe's largest maturing centre for mountain cheese and contains experts wielding forbidding knives. 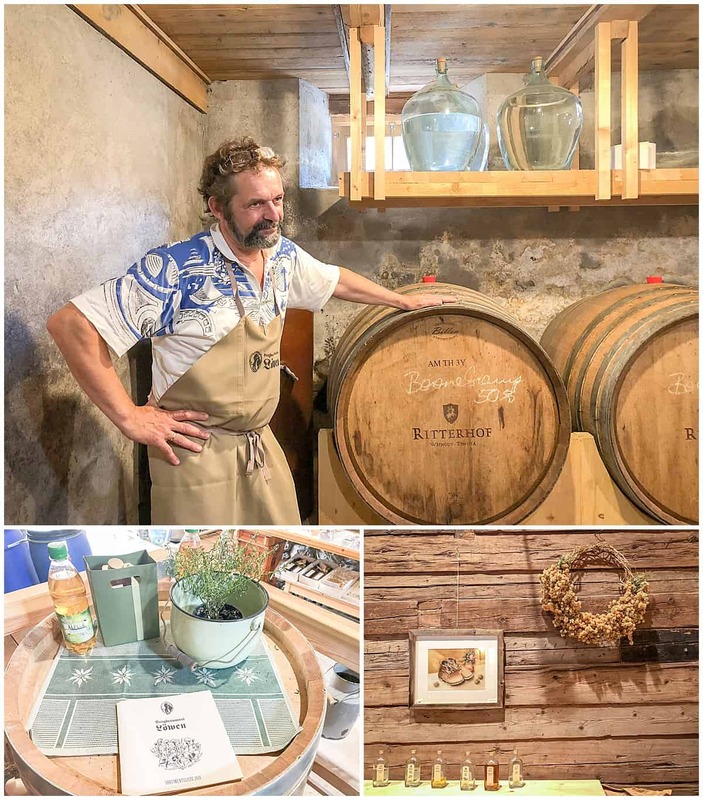 Never mind making lemons from lemonade, the Loewen Distillery turns mountain herbs and hay into a veritable schnapps testing party. And still manages to make it feel like a cultural experience. Known as the “showpiece cheese,” this is a hard cheese whose flavour intensifies the longer it matures. The cheese is produced in 17 village dairies and, in the summer months, on around 70 alpine pastures. Only Heumilch or “silo-free” milk is used. To give you an idea of how rare that is, only around three percent of the milk produced in the EU is silo-free. A slightly odd looking one, ‘Alpzieger’ belongs to Vorarlberg. It’s made from whey and mixed in with around 40 different herbs, giving it a distinct pale green colour. The Gsig’ or ‘Sig’ type is brown as the lactose is caramelised. They call it “Bregenzerwald chocolate.” It’s sweet and enjoyable and all but it’s best served as cheese or with desserts, rather than in the shape of a bunny at Easter. You have been warned. Elsewhere, you’ll find a range of unpasteurised products from goats, sheep and cows. Look out for Bachensteiner, a red, semi-soft cheese. Clean, traditional design with a modern twist. That appears to be the motto at the Hotel Gasthof Krone in Hittisau. Facing the mountains in one direction and the small, painted chapel in the other, the hotel used local carpenters to refurbish and redesign this lovely place and you can read more about that in the glossy books in the firelit lounge. Dine at their restaurant, The Krone, for views of the town square and expertly filleted fish at the table. From there, it’s best to hire a car. 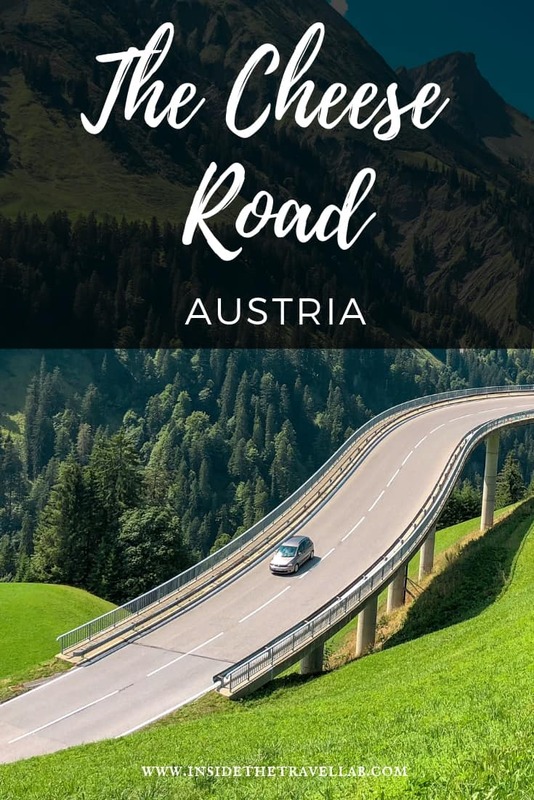 Although the mountain roads are steep and swerving, they’re generally very forgiving for nervous drivers and provide much more space than mountain roads elsewhere in Europe. Disclosure: This trip was part of a paid project with Captivate and the Official Tourism Portal of Vorarlberg. However, as ever, as always, I kept the right to write what I like. And I take full credit for all the enthusiasm about cheese! To find out more about this region, visit the Bregenzerwald Travel Website.